fascinated me; it was extremely exciting for me to go into the chicken house, something others found rather odd since they avoided doing so at all costs. Finally later in my life, we were able to get some bantam chickens and I was totally infatuated with them from the get-go. 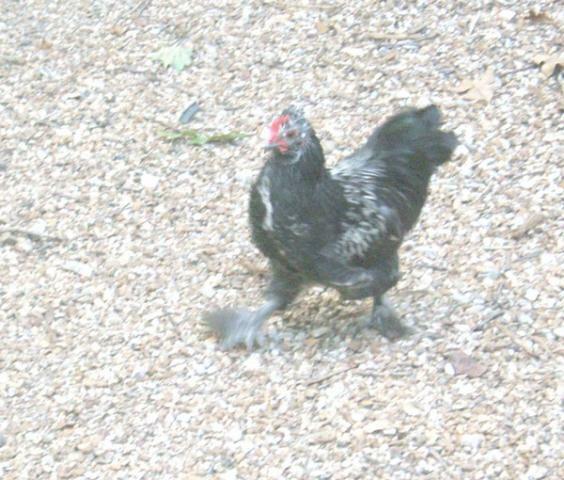 Now I write a blog about chickens called "Diary of a Chicken Watcher ." I have learned that chickens are intelligent, social, moods, feel trauma when something bad happens (like being attacked by a raccoon or a big dog), they are close knit and loyal, one rooster can rule but with training you can have more roosters, and so much more. I'll let this page evolve as I enjoy this wonderful forum. Winter was coming and it was September 2007; our chickens did not have a really good chicken house yet so Larry and I drew some plans (took a week), bought the lumber (had to go buy more 4 times) and started building (we expected it to be done within a few days at most (took over five weeks). During the whole time, all the darling chickens stood around and watched us work, probably because we were building it so close to their old chicken coop. The day it was done, Rocky the Rooster, the boss of the whole flock, just walked in, flew up on the new roost and it was as easy as that. On the left is Darth Vader. We kept him and Quail but found a good home for all the other chickens. I loved each and every one of them and knew them all very well. Darth Vader disappeared one day and we never saw him again. A wooden long bench that he liked to roost on for an afternoon nap was turned over and we found one black feather nearby. Now Quail is alone and my heart breaks with the loneliness I know she feels. 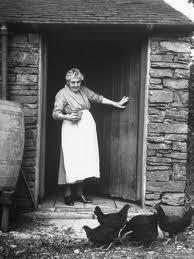 They were all her family, 3 of the chickens were her children (full-grown). Note added: January 21, 2012. Quail is gone now over a year ago.